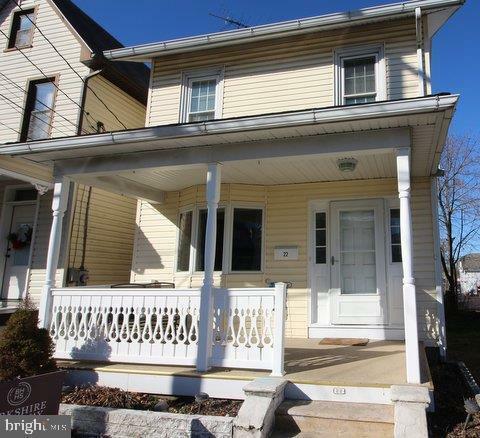 Do not miss out on this Quakertown Borough two story single home. It is charming and in a desirable location! Walk onto the quaint porch and through the front door into a large, open living room, followed by an eat-in kitchen. The laundry room is located on the first floor with a half bath. There is a finished three season room/studio with bamboo flooring, built in speakers and is cable ready. On the second floor, there are two bedrooms and a full bathroom with crown molding through out. The master bedroom is ceiling fan ready. The full bathroom was updated with a large walk-in closet, stand up shower, large tub, two sinks and is cable ready! There is a full size attic on the third floor. In the basement is a natural gas heater which was installed in 2009, as well as a water softener and a work bench. The house is Fios, Comcast and Direct TV ready. Like being outside? You can relax in the back yard. There is a large shed, plus a two car garage with heat, electric, water and an extra refrigerator. The garage also has a built in air compressor, garage door opener and carpeting. All within walking distance of downtown Quakertown. What is not to love?